An application developed with NetPhantom 6 can be compiled with backward compatibility for NetPhantom 5 Servers. This enables using the powerful NetPhantom 6 development environment even for NetPhantom 5. An application that is compiled for NetPhantom 5 cannot be imported in NetPhantom Editor 6.x, and will produce unpredictable results if unpacked and opened with NetPhantom Editor 5.x. 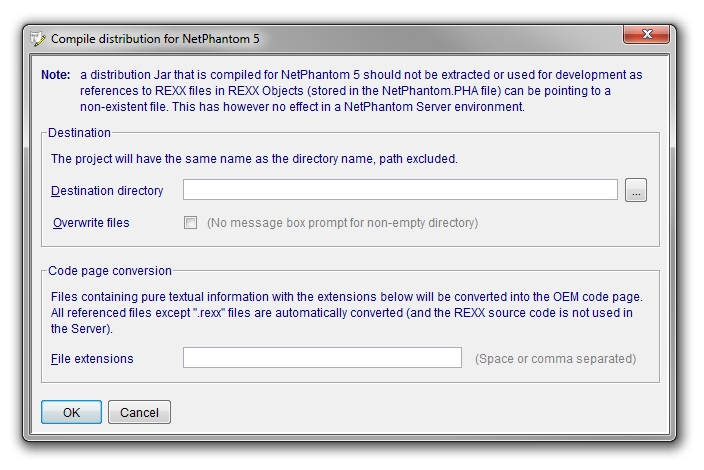 The compiled application Jar is only intended to be used with NetPhantom Client and Server 5.x. Fill in the Destination directory where the Jar file will be created and select the option Overwrite files if you wish to avoid the message box about non-empty destination directory. You may also specify File extensions that will be code page converted from the Windows character set (e.g. 1252) to the Server OEM code page (e.g. 437). All files that the application refers to, e.g. combobox files, will be converted, but if files are accessed programmatically e.g. by REXX, these files may not use the correct code page. The compile distribution creates a Jar file with the same name specified in the Project definition as Project file (Jar), but placed in the Destination directory. If you require additional files outside the Jar (i.e. externally), these files must be either extracted from the created Jar file or copied (and perhaps code page converted). The Java Development Kit contains a utility called native2ascii that can be used for code page conversion. The code pages would in this case be named Cp1252 for Windows and Cp437 for OEM. For the utility, see the on-line document. To compile a distribution for NetPhantom 5, some limitations apply as decribed below. New NetPhantom 6 panel controls cannot be used. These are the Tree Control and the HTML option for Static Text. The new User Window predefined types for line drawing cannot be used as they are unsupported in NetPhantom 5. REXX file names cannot be longer than 12 characters (excluding the .rexx file extension). The fully qualified class name for a Java Object cannot exceed 78 characters. NetPhantom 5 does not support the Virtual Panel Interface, so only Java Objects extending the se.entra.phantom.server.REXXMigration class is supported (or implementing the interface se.entra.phantom.server.ObjectCalling).